Swiss Lotto is the biggest lottery in Switzerland, with jackpots that start at CHF 1.5 million (€1.3 million) and can go much, much higher because there is no cap on rollovers. Featuring decent odds of winning and excellent secondary prizes, this double-matrix game has turned more than 939 people into millionaires—an average of 20 per year—during its long and rich history. As a result, it's become quite popular among curious international players searching for the world's best lottos. Swiss Lotto has been around since 1970, which makes it one of the longest-running lottery games in the world. Its roots, however, go even further back than that to August 1937 when two separate companies, SwissLos and Loterie Romande, were first established. These two companies jointly operated many different lotteries over the decades, with SwissLos offering them in Switzerland’s German-speaking areas and Loterie Romande offering them in the French-speaking areas. And this is exactly how Swiss Lotto, the companies’ most popular game of all time, is operated today. Swiss Lotto originally had a 6/40 format, meaning players had to choose 6 numbers from a possibly 40, but the odds were made a bit tougher in April 1986 when the range increased to 42. The Joker game, which is an optional game that players can enter to win additional prizes, was added in 1988. The rePLAY feature (more on this below) was introduced in March 2007, and the current form of the game has stayed consistent since 2013. Moreover, for 27 years Swiss Lotto was a weekly lottery, meaning its draws only took place one day per week (on Saturdays). However, this changed on January 8, 1997, when a Wednesday draw was added to the mix that doubled people’s chances of winning. Many of the proceeds from Swiss Lotto fund a wide range of social programs related to culture, amateur and professional sports, the environment, youth, senior citizens, education, health, tourism, and more. Aside from its generous jackpots, a lot of Swiss Lotto’s popularity is also tied to its easy game mechanics. To play, you choose 6 numbers from a range of 1 to 42, as well as an additional bonus number from a range of 1 to 6. This bonus number is called the “Glückszahl” in German and the “N° Chance” in French. If you match all six numbers from the first set and the bonus number from the second set, you win the jackpot. However, even if you don’t nab the grand prize, there are seven secondary prize tiers that you can win, several of which still offer excellent windfalls. What’s more, if you are willing to pay a small additional fee, you get a chance to win the Joker jackpot. This is a separate draw with six different numbers, and you have to match a minimum of 2 numbers in a row (from left to right) to win a prize. If you’re lucky enough to match all 6 numbers, you will win the Swiss Lotto Joker jackpot, which has climbed to millions of francs on many occasions. Another great feature, one that is unique only to Swiss Lotto, is the rePLAY feature. This is a feature that is automatically applied—for free—to each purchased ticket and gives you a shot at winning a free play for the next draw that’s worth as much as your original purchase. Therefore, this feature can double your chances of winning. How it works is that in the bottom right of every ticket purchased there is an additional number known as a rePLAY number that falls within a range from 1 to 13. If your rePLAY number matches the one that’s announced during the draw, you win a free “Quick Tip” (the Swiss Lotto term for auto/random pick) entry into the next draw. When compared to other major national and transnational lotteries, your chances of winning the Swiss Lotto jackpot aren’t too bad: 1 in 31,474,716. This is a world of a difference compared to mega lottos like SuperEnaLotto (1 in 622,614,630), US Powerball (1 in 292,201,338), Mega Millions (1 in 292,201,338), EuroMillions (1 in 139,838,160), or EuroJackpot (1 in 95,344,200). Furthermore, they are about 50% bit better than winning UK Lotto (1 in 45,057,474). However, your odds of winning France Lotto (1 in 19,068,840), Swedish Lotto (1 in 6,724,520), or Austria Lotto (1 in 8,415,060) are quite a bit better. In the end, it’s up to you to decide what you prefer—better odds or better prizes? The Swiss Lotto draws take place twice per week in Zurich, Switzerland’s capital. The first draw is on Wednesdays at 7 pm CET, and the second one takes place on Saturdays at 5 pm CET. 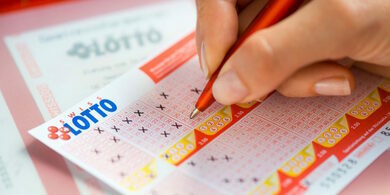 All Swiss Lotto prizes are paid out in cash form and must be claimed within 26 weeks. Any prizes that exceed CHF 1,000 are subject to a 35% tax—which can add up to a pretty big chunk of money, particularly if you win a jackpot. In addition, if your country of residence also taxes lottery winnings, then you could be double taxed. If you're not sure about this, then research your local tax laws online to see what your government's stance on this is. There was a time not so long ago when Swiss Lotto was open only to Switzerland’s residents and visitors. Nowadays, thanks to the Internet and the many great lottery sites that exist, you can play Swiss Lotto from wherever you like. Most of these sites are reputable businesses that have been offering people the convenience to play whatever international lotteries they desire for many years. Quite a few of them also offer welcome bonuses and other enticing deals that give plenty of value for the small fees they charge. Swiss Lotto – Is It Worth Playing? In our opinion, Swiss Lotto is certainly worth trying out—and possibly even playing regularly. Although the 35% tax would be a pretty bitter pill for any big winner to swallow, what you’d walk away with at the end of the day would still be fantastic. In sum, Swiss Lotto jackpots are often very attractive, and the fairly good odds and automatic rePLAY feature and optional Joker jackpots give players a lotto experience that is definitely exciting overall. I'm a bit of a online lottery tourist and was thinking about trying out this game, and still might, but the 35% tax really turns me off. That's ALOT of money. I'll play a few other lotteries before I eventually get around to this one. Thanks for the good research in this review tho!